Will Windows 8 Save the PC Business? Predictions are in already: Windows 8 will be irrelevant. The clues seem to support the suspicion – the masses are already happy with Windows 7. Enterprise already made a substantial investment upgrading to Windows 7. Another migration in 2012 is just too soon. But putting all that aside, the PC manufacturers need to support Windows 8 because it’s the platform that will finally bring integration of desktop PCs with Tablets1 – especially in an Enterprise environment. There’s also a good list of new features that will ensure some to upgrade. Plus, there are millions of new PCs and Laptops to sell, every year. Windows 8 is still relevant and it will save the PC business. This entry was posted in Hardware, Software and tagged enterprise, microsoft, pc, windows on December 6, 2011 by Rudy Amid. Taking the headline from Time Business article, the PC industry is certainly in a different place now. The PC, aka Microsoft based laptops and desktops, have always been the corporate standard for productivity machines. On the Enterprise level, corporate users demand Microsoft products (ie. Powerpoint) suites, VPN to access internal servers behind the firewall, Remote Desktop for Windows servers, and in some cases, multiple monitors for multitasking needs. However, there’s been grumbling about the tablets taking over Enterprise issued PCs and Laptops – mainly due to juggernaut Apple’s iPad. In response, there are now many more tablet offerings from RIM, Toshiba, ACER, or ASUS. But such ventures do not always end up well. HP pulled the Touchpad after 6 weeks of production!1 That’s just the start – who knows who else will quit the quest to quell the iPad. There’s a glimmer of hope to revitalize the PC business: the Ultra-thin laptops are coming. Recently, Toshiba has just announced a good looking one called the Z830 coming this November. Lenovo has an offering. Even ACER is in the mix. Just in time too. There’s a need the lightest portable laptop that will not break one’s back. It helps that it looks as cool as the Macbook Air. One problem though: price. It’s understandable why Apple charges way too much for the Macbooks – they’ve historically done this since the Apple II days2. But the PC should not cost as much. To be more competitive, there’s an expectation the PC Ultrathin laptops to be (much) cheaper than the Macbook Air, if they want to sell more of it. Kind of like the HP Touchpad fire sale. So here’s hoping the evolution of the PC is towards something more useful, powerful, affordable, and highly portable. There’s still life in the PC world. This entry was posted in Hardware and tagged laptop, microsoft, pc, portable, ultrathin on September 4, 2011 by Rudy Amid. 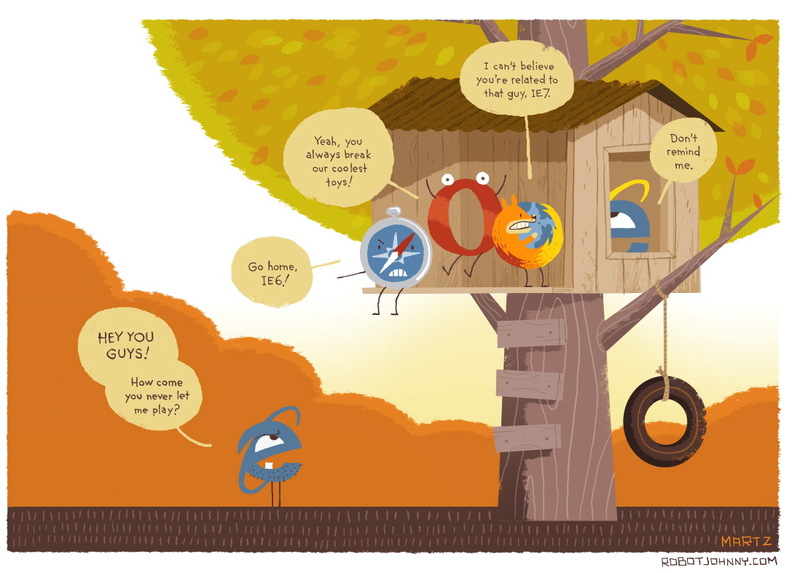 It’s steadily dropping because of the wide acceptance of Firefox, and Corporations are proactively upgrading to IE7 or IE8. This number will change dramatically when Enterprise favors Windows 7 as the new standard for productivity machines. Some websites have already taken steps to prevent IE6 from loading their site. I can only applaud their efforts. This entry was posted in Software and tagged browsers, microsoft, web on June 16, 2009 by Rudy Amid.